Hello everyone! My name is Edith, but my friends call me Edie. 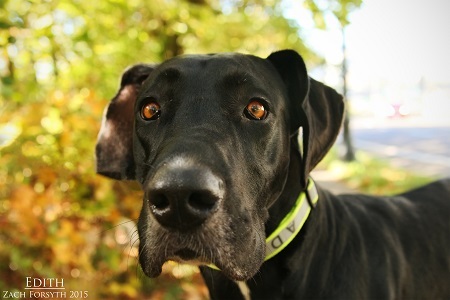 I am a delightful 2 1/2 year old Great Dane whose heart is as big as my body, which is extra large! True to my breed I am sensitive, affectionate and deeply loyal. You can count on me if I can lean on you! I am a smart girl who will gain confidence and have fun with positive reinforcement training. I do well with all other dogs, and cats, and since my demeanor is naturally quiet I prefer a home with older kids. Do I sound like the lady you have been looking for? Fill out the adoption application so we can schedule a meet and greet. I am fixed, vaccinated and microchipped. My adoption fee is $350.